A range of skin tones -- including the existing yellow and five other shades -- will be available when Unicode Version 8.0 launches in June 2015. Emojis are going to get racial diversity, with the first white and black emojis coming out next year. 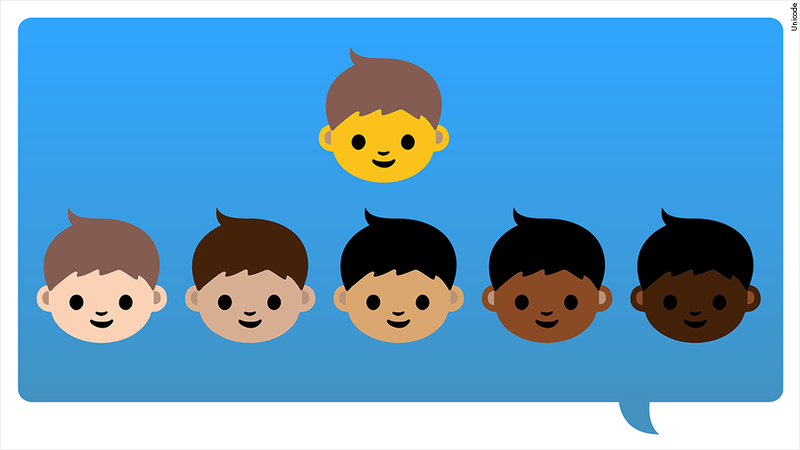 Unicode, the organization that develops emojis, said that a diverse range of skin tones will be available when Unicode Version 8.0 launches in June 2015. This will include not only the existing yellow, but five other shades, ranging from pink and brown to black. "People all over the world want to have emoji that reflect more human diversity, especially for skin tone," said Unicode, in a report with design recommendations. Emojis are phone text pictographs referred to as emoticons used to express feelings. The faces are yellow, with a skin tone mimicking the Caucasian characters on "The Simpsons." Emojis were developed in Japan in 1999 for mobile phones. In Japanese, emoji means picture-writing-character. They were originally meant to be race-neutral, sort of like the gray-skinned people in Ursula Le Guin's sci-fi novel "The Lathe of Heaven." "The Unicode emoji characters for people and body parts are meant to be generic," the Unicode document said. "Yet following the precedents set by the original Japanese carrier images, they are often shown with a light skin tone instead of a more generic (inhuman) appearance." Unicode 8.0 is adding a range of skin tones that "are based on the six tones of the Fitzpatrick scale, a recognized standard for dermatology." Developed in 1975 by Harvard dermatologist Thomas Fitzpatrick, the scale classified human skin color based on their response to ultraviolet light.